Thank you for your interest in the Bangkok-January Fair. Registrations open August 16th, 2020. As a fair early in the recruiting season, the Bangkok-January Fair favors strong teaching couples and singles without dependents. The numbers in attendance are expected to be about 550 candidates and 140 schools (most of which bring two or more recruiters). The schools recruiting at this fair come from a wide variety of locations worldwide, with many attending from Asia. Search Associates-registered candidates, of all nationalities and all standard specialist fields in schools, are welcome to request an invitation to attend the Bangkok-January Fair. Please read the Frequently Asked Questions (FAQs) about Job Fairs on the website. Because of the large number of schools regularly attending this fair, there may be a wait-list established. Candidates must be registered with a branch of Search Associates if they wish to request an invitation to attend the Bangkok-January Job Fair. Attendance at this fair is by invitation only. Checking "interest in the Bangkok-January Fair" on the Search Associate online application does NOT constitute an invitation. Because this is an early fair and attended by highly experienced international educators, this fair is quite competitive. Recruiters know that they have other fairs to attend at later dates, so they are very selective in this first round. PLEASE ASK your sponsoring associate to determine if this fair is a good match for you or if another fair would be a better "fit". Some schools will be looking to employ candidates who have IB experience. Check the list of registered schools and do your homework beforehand. You may stand out more at a smaller fair, as these fairs traditionally attract local teachers who do not have international experience. Candidates who are already registered with Search Associates should notify their Search sponsor of their interest in this fair to request an invitation. Harry Deelman – Candidates with IB experience, (PYP, MYP, and/or DP) and aiming mainly at an IB job in an IB school should register with Harry Deelman. 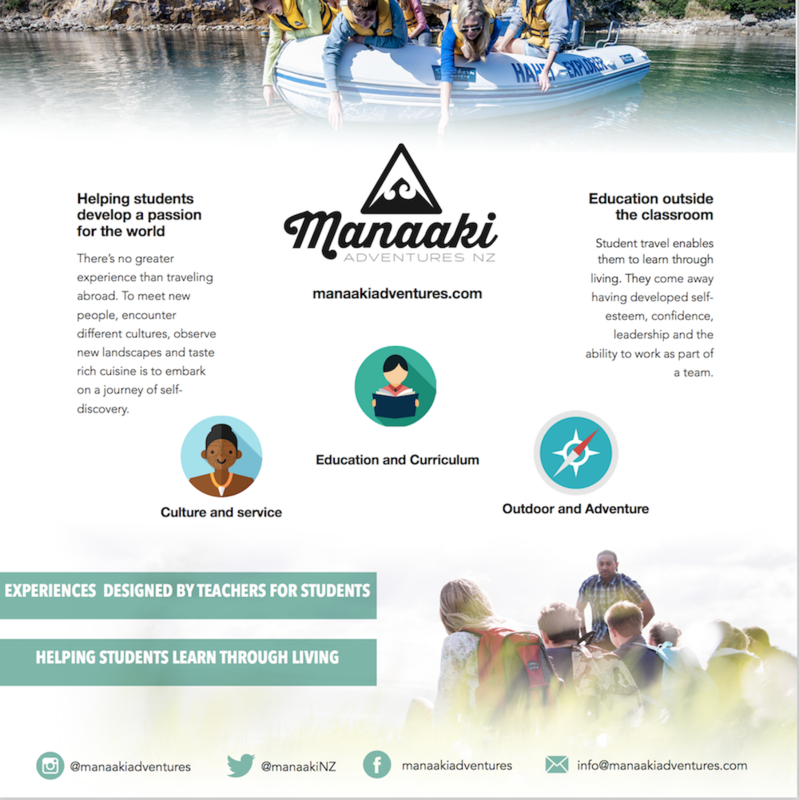 · Essential attendance from 10 January to late afternoon on 13 January. Please note: attendance is by invitation only. 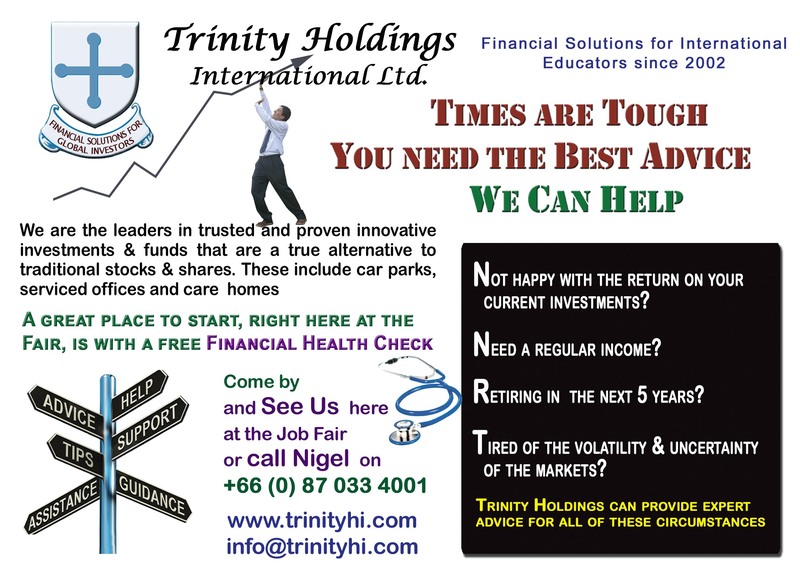 · Registration for Candidates begins on 10 January. 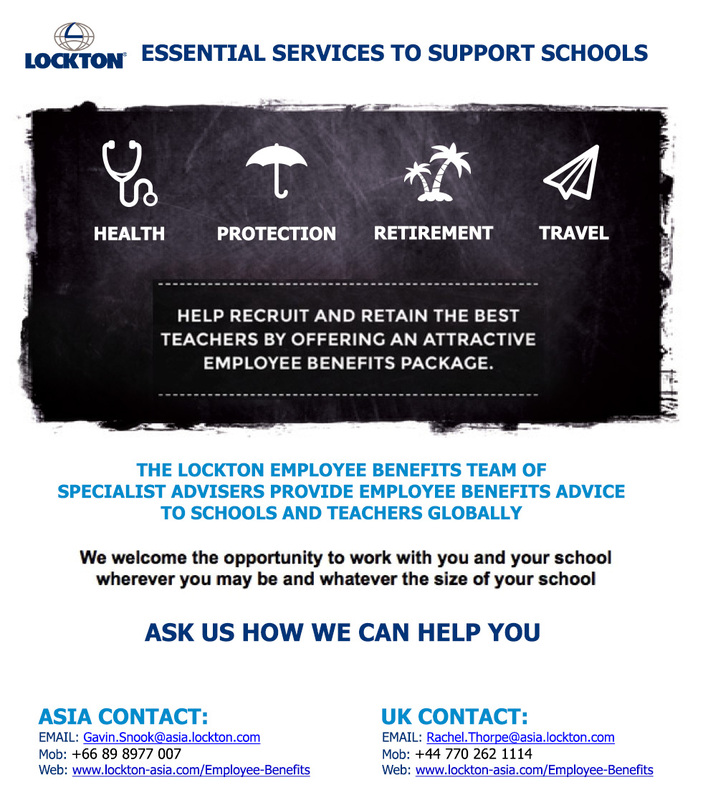 · To get the most from your Fair experience we advise attendance at a candidate orientation meeting (Highly recommended for all teachers but especially for those new to the Bangkok Fair). · DO NOT BE LATE to the interview sign-up session. The interviews arranged will determine your schedule for January 11 - 13. An early request to your sponsoring associate (after becoming an active Search Associates candidate) for an invitation is important - best during SEPTEMBER or OCTOBER. Candidates will only be invited to attend the Bangkok-January Fair if we consider that they match the needs of the recruiters who will be at the fair and stand a real chance of receiving offers. About 50-60% of the fair attendees are expected to accept contracts resulting from the fair. Suvarnabhumi (Sah-var-nah-boom) International Airport handles international flights. IF ARRIVING FROM WITHIN THAILAND, YOUR FLIGHT MAY USE DON MUAN AIRPORT. Change money at the airport bank stalls; be sure to get a few Baht 20 and Baht 50 bills. The public taxi stand is located on Level 1 (ground level) near entrances 3, 4, 7 and 8. There is a taxi counter with personnel to ensure the driver understands your destination. Have the hotel and its address written on a piece of paper for ease of understanding It is best to get a metered taxi to your hotel. You will be asked to pay the toll charges on top of the taxi fare, as well as a 50 baht fee to the driver (only applicable to taxis from the airports). Tipping is not expected, but appreciated. If you only have 1000 baht notes, it is suggested that you use one to pay the toll. That way, you will get change in smaller notes. Tell the taxi: Marriott Marquis hotel, Sukhumvit Soi 22. 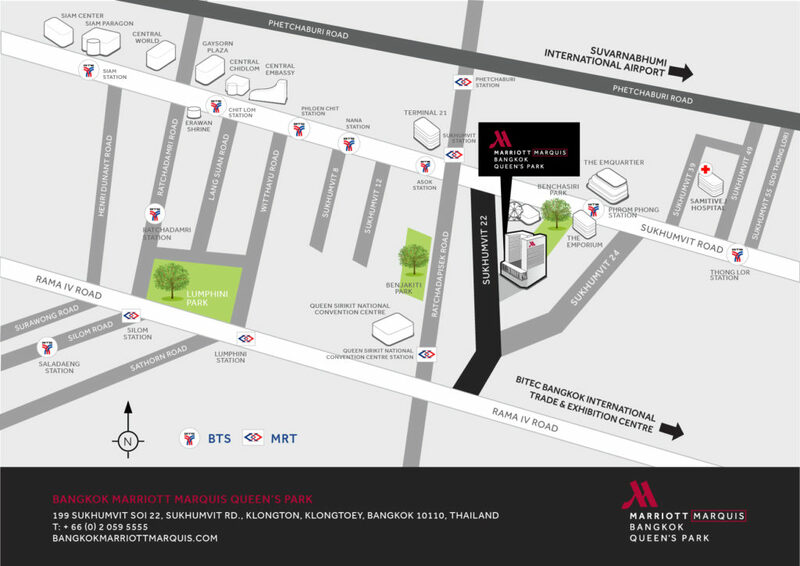 The Marriott Hotel is located just 40 kilometers from the Suvarnabhumi Airport. Bangkok traffic can be challenging. Be sure to add extra time if you are scheduled to travel between 7am - 9 am and from 4 pm onwards. Friday and Saturday nights are particularly busy. Metered taxi is an easy way to get around Bangkok, though traffic jams are legendary. The hotel doormen will assist making sure the driver understands your destination and uses his meter. SkyTrain, (BTS) is half of Bangkok's rapid transit system. The nearest SkyTrain stop is at Phrom Phong BTS Station (although the Asok BTS station is not that much further in the other direction if walking along the street - Soi 22 is about half way between the 2 stations). You can buy single trip tickets for the BTS using the machines at the station (having a supply of coins is recommended for this). Alternately, you could purchase a Rabbit Card (for 100 baht) and then put some ‘credit’ on it, and use the turnstiles at any of the stations (tap on - tap off). This is often quicker as the queues at the ticket machines can be long at times. There is also a subway (MRT). 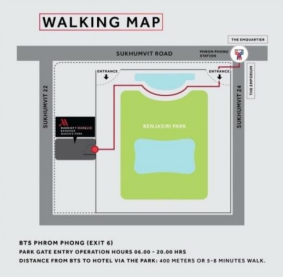 Get a BTS/MRT map from the hotel concierge. The nearest MRT stop is at Sukhumvit Station - see below (right next to the Asok BTS station). The close proximity to BTS Sky train Station Phrom Phong, as well as the EM District lifestyle malls, enable easy access to some of the city’s most talked about hotspots. Only 400 meters or approximate 5 minutes walk from BTS to hotel via Park. Please note that the gate is now open every day from 06.00-20.00 hrs. The longest road in Thailand, both it and its many adjoining 'sois' (sub-streets) are poor on traditional tourist attractions but rich in of-the-minute shopping, eating and nightlife. The many fashionable restaurants, bars, air-conditioned malls, luxury hotels and hip clubs give the area a distinctly modern, cosmopolitan flavour. And little, stress-busting pockets of calm can be found in the sweet cafes, atmospheric restaurants and lush day spas that hide down many of its sois. Making exploring its staggering length incredibly easy is the Skytrain (BTS) that runs through most of its downtown stretch. Buy a phone card at 7/11 or other shops. Use specially marked gold street phone booths, or use Skype at Internet cafes. The team from Expat Property Planners will be attending the Bangkok fair and be able to assist you with any questions or planning for your adventure abroad. SEE YOU AT THE BANGKOK FAIR!